Ordinary People (1980): Dir. Robert Redford. Written by: Alvin Sargent and Nancy Dowd. Based upon the novel of the same name by Judith Guest. Starring: Timothy Hutton, Donald Sutherland, Mary Tyler Moore, Judd Hirsch, and Elizabeth McGovern. Rated R for language. Running time: 124 minutes. Family dramas were still the rage in Tinseltown, this one a directorial debut from Hollywood icon Robert Redford. An exposure of hidden dysfunction, Redford’s film dealt openly and honestly with delusional upper-crust families. After a traumatic family tragedy, the Jarretts are on the verge of collapse. Son Conrad has attempted suicide, mother Beth blames him for the accident, and father Calvin attempts to hold everyone together. Refusing to share their feelings with one another, each family member attempts to adapt to the trauma in their own (sometimes self-destructive) way. Redford assembles an incredibly capable cast for this family drama that relies more on the strength of character and acting than on visual flair. Timothy Hutton as the young Conrad seems utterly natural as the guilt-stricken son. He and the script avoid the danger of defining him by his depression—he has wit and compassion to spare. Judd Hirsch proves a steadying influence as Conrad’s psychiatrist, and Mary Tyler Moore as Conrad’s mother wholly abandons her television persona playing an icy mother to whom domesticity is a safeguard from emotion. Redford reveals the trauma gradually, and doesn’t attempt to explain this one event as the sole source of the family’s dysfunction. Unfortunately, the script seems content to telegraph emotion for us, with its abundance of expository monologuing. We’re given to understand the exact motivations for every bit of familial behavior, which simplifies the Jarretts’ complicated problems even before the trauma. But the actors can really sell it—Donald Sutherland breaks Calvin’s in-control exterior to deliver a solid one late in the film, where he finally reveals the cold, hard truth about his wife. 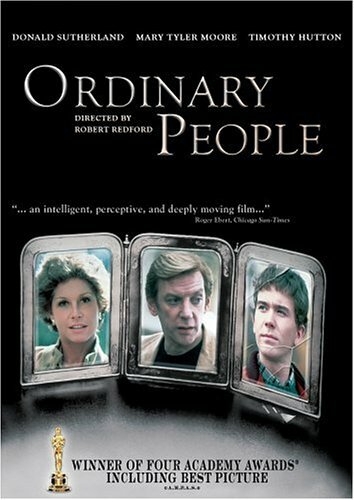 Like another Oscar-winning film about family (1972’s The Godfather), Ordinary People features people striving to protect the pale illusion of familial love. It’s not exactly Eugene O’Neill, but it’s still powerful stuff.